Corvettes have had headlights under plastic lenses starting with the C6. A problem with plastic headlights can be that, over time, plastics made from polycarbonate may turn a yellowish-brown and develop a rough or crusty surface. Not only is that ugly, but it also reduces the brightness of the headlights. Ultraviolet ("UV") rays in sunlight cause a chemical change in the polycarbonate which has a yellowish-brown "haze" developing on the surface. This happens, not only in direct sunlight but can happen on cloudy days, too. 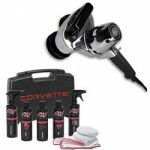 The more your Corvette's headlight lenses are exposed to natural light, the more they'll tend to turn yellowish-brown. If your car spends most of its life in a garage, under a cover or has WeatherTech LampGard headlight protectors installed, then you'll never have trouble with hazed headlights. Otherwise, over time, your headlight lenses will get ugly. 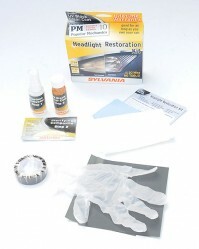 The Sylvania kit comes with most of the materials required for restoring your plastic lights. All you need to supply is water and some absorbent towels. The process is in three easy steps. First, is to apply a "surface activator/cleaner" which you leave on the lens for a short period then wash off. The second step is sanding and polishing. You will wet-sand the headlight lens with fine (400-grit), then extra fine (1000- and 2000-grit) sand paper. A lot of pressure is unnecessary. We found using a small, rectangular sponge as a "sanding block" made the job a little easier. You follow the wet-sanding with polishing using Sylvania's "Clarifying Compound". After washing that off you apply some more Activator. The third and final step is to apply a Clear Coat which dries hard and acts as a UV blocker. It takes about an hour to do two average sized headlights. Curing time is 4-6-hours. Because our only C6 Vette has headlight lenses which have WeatherTech LampGards and because we wanted a really bad set of headlights to use in this test, we borrowed our neighbor's GMC Yukon. From a pictures, you can see the difference between the unrestored and restored headlights is amazing. For more information see Sylvania's headlight restoration web page.